A one-of-a-kind celebration of the 101 two-letter words allowed in Scrabble. 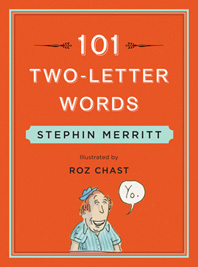 Rolling Stone has called singer-songwriter Stephin Merritt of the Magnetic Fields “the Cole Porter of his generation”; O, The Oprah Magazine has hailed cartoonist Roz Chast as “the wryest pen since Dorothy Parker’s.” Together they have crafted a wonderfully witty book that is sure to prove useful to Scrabble players and Words With Friends addicts—and to delight anyone in thrall to the weirder corners of the English language. I really cannot bear it. it’s funny and it’s useful too.